[130 Pages Report] The automotive gesture recognition systems market is estimated to be USD 829.5 Million in 2016, and is growing at a CAGR of 30.5%. The base year for the report is 2015 and the forecast year is 2021. The objective of the study is to analyze and forecast (2016 to 2021) the market size, in terms of volume ('000 Units) and value (USD million), of the automotive GRS market. The report segments the market by authentication type, by component type, by Application and by region namely, North America, Europe, Asia-Pacific, and the Rest of the World (RoW). A detailed study of various market leaders has been done and opportunity analysis has been provided in the report. Various secondary sources, such as company annual reports/presentations, press releases, industry association publications, magazine articles, encyclopedias, directories, technical handbooks, world economic outlook, trade websites, technical articles, and databases have been used to identify and collect information useful for an extensive study of the automotive market. The primary sources experts from related industries, automotive GRS manufacturers, and GRS experts-have been interviewed to obtain and verify critical information, as well as to assess future prospects and market estimations. Bottom-up approach has been used for market estimation and calculation of the automotive GRS market size. The figure given below illustrates the break-up of the profile of industry experts who participated in primary discussions. The automotive GRS market consists of various major system manufacturers. Companies such as Continental AG (Germany), HARMAN International Industries (U.S.), SoftKinetic (Belgium), Synaptics Incorporated (U.S), Visteon Corp (U.S), NXP Semiconductors (Netherlands), Omek Interactive Ltd. (Israel), Qualcomm Inc. (U.S.), eyeSight Technologies Ltd. (Israel) and Cognitec Systems GmbH (Germany) are the major manufacturers of gesture recognition systems globally. The automotive gesture recognition systems (GRS) market is projected to grow at a CAGR of 30.5%, from USD 829.5 Million in 2016 to USD 3144.8 Million by 2021. The rise in consumer preference for application based technologies and increasing awareness about driver safety and regulations in automobile industry have fueled the growth of the automotive gesture recognition systems market. The increase in demand for autonomous and electric vehicles is also a major factor that will contribute to the growth of the automotive GRS market. The Hand/ Fingerprint authentication type is estimated to record the largest market size in automotive gesture recognition systems market, by authentication type. Factors such as innovations in technological advancement, and increased safety regulations are prompting the growth of the visual interface market. The Multimedia/ infotainment /navigation segment is estimated be the fastest growing during the forecast period. With the increased focus on reducing driver distraction factors, a majority of the gesture recognition systems manufacturers and OEMs are focusing on enhancing the user experience while operating these infotainment or navigation systems and providing convenience and comfort to the driver. The touchless system segment in automotive gesture recognition systems market, by component type is estimated be the fastest growing during the forecast period. This is due to factors such as enhanced user experience in the various applications offered by touchless gesture recognition systems and convenience to the driver. The European region is estimated to be the largest market with the highest share of the automotive gesture recognition systems market, by value and volume. 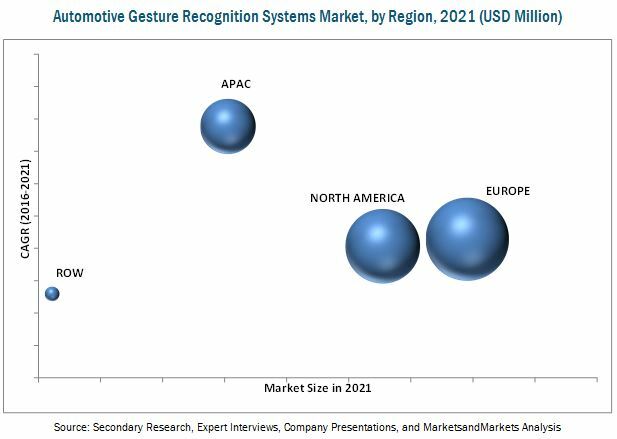 The European automotive gesture recognition systems market is projected to be the largest market owing to the high penetration of GRS as well as high vehicle production and sales due to high disposable income in countries like Germany and U.K. The major restraint considered in the study is the high cost of integration of GRS systems. In addition, the processing of gestures requires a high level of software algorithms, which results in high battery consumption and increased usage of processor space. 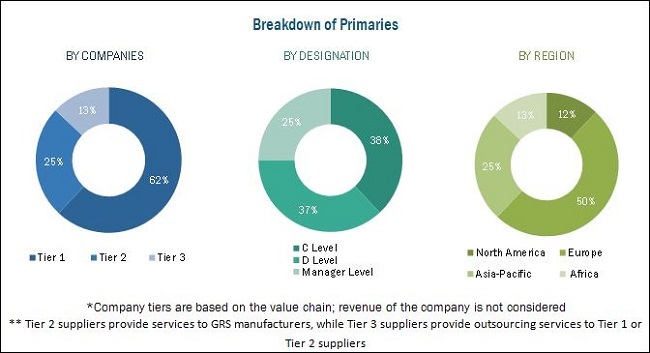 The Automotive GRS market is dominated by many international as well as domestic players, and some of them are Continental AG (Germany), Visteon Corp (U.S.), and Synaptics Incorporated (U.S). 11.4 Harman International Industries, Inc. Figure 45 Company Snapshot: Qualcomm Inc. Figure 47 Company Snapshot: NXP Semiconductors N.V. Figure 50 Company Snapshot: Omek Interactive Ltd.